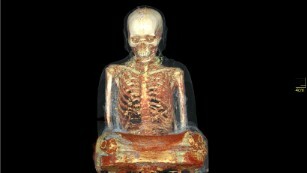 (CNN) A statue of a sitting Buddha that made its way from a temple in China to a market in the Netherlands revealed an extraordinary secret — a 1,000-year-old mummified monk. The mummy was discovered, encased in a cavity in the statue when a private buyer brought it to an expert for restoration. It’s unclear when or how the statue was removed from China. A CT scan of the golden statue. But it wasn’t until a team of researchers and scientists did a CT scan — a comprehensive three-dimensional x-ray image — last year, did they discover the mummy’s organs were missing. “We thought it would be lung tissue, but instead we found little scraps of paper covered with Chinese characters,” said Vincent van Vilsteren, an archaeology curator from Drents Museum. The mummy was found sitting on a bundle of cloth covered in Chinese inscriptions, revealing its identity as a Buddhist monk called Liuquan who may have practised “self-mummification” to prepare for life after death. The process of self-mummification is a known tradition in countries like Japan, China and Thailand, and was practised over a thousand years ago. 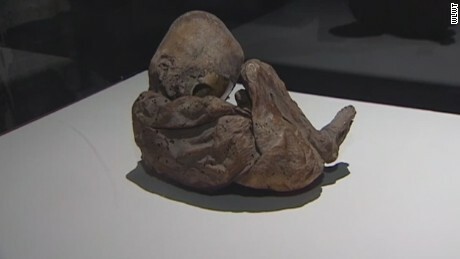 “We suspect that for the first 200 years, the mummy was exposed and worshipped in a Buddhist temple in China… only in the 14th century did they do all the work to transform it into a nice statue,” said van Vilsteren.